Ben has joined the ranks of the readers. It has to be the biggest magic trick there is! One day the words on the pages of a book are lines and symbols. You might recognize a word or two, but comprehension is a long way off. And then the lines and symbols are suddenly a story! And there are so many stories to read! There is an entire world of stories, just waiting to be gobbled up, one after another. 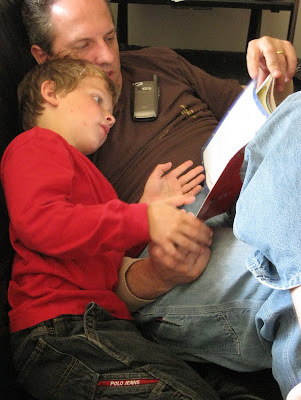 Benjamin has been able to read individual words for some time, but he would always say he couldn't "read". To him, reading was picking up a book and going from start to finish, laughing at the funny parts. Since about Christmas I've noticed that I will start reading to him and he will tell me to stop and pick up where I left off. To me, it is among the most incredible things in child raising... right up there with the feeling of being pregnant and feeling those first fluttery kicks, or the first time baby sleeps through the night. It's magical, miraculous, and amazing. This week during Spring Break, Benjamin has climbed into my lap to read me book after book. He didn't ask me to read to him at all. I was a little blue about it. Until this weekend when Ben grabbed one of more difficult Magic School Bus books, climbed onto Daddy, and sweetly asked to be read to. It's nice to be needed!